The prices on this website include, a new rubber valve, wheel balance, VAT and fitting to loose wheels. 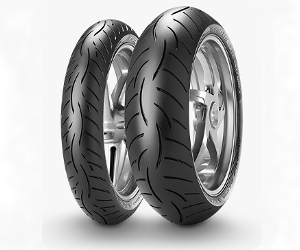 We are very happy to remove and replace the wheels from your motorcycle for the additional fee of £25 (including VAT) per wheel. You can choose this option when you place your order. These tyres have had many rave reviews over the years, but few people realize just how good they are in the wet. In this test carried out in Milan it beat the michelin Pilot Road 3 and the Dunlop Roadsmart II for wet weather grip! Metzeler’s Interact Technology has a patented steel belt with various winding tensions across the carcass. It employs high tension for high-mileage in a straight line, and low tension on the shoulders for excellent grip in corners. High winding tension in the center reduces compound movement and increases stability of the footprint area which reduces wear and ensures high speed stability on long motorway journeys. On the shoulders, low winding tension creates more flexibility and therefore higher energy absorption, the compound increases in temperature and becomes softer to offer more grip while leaning.